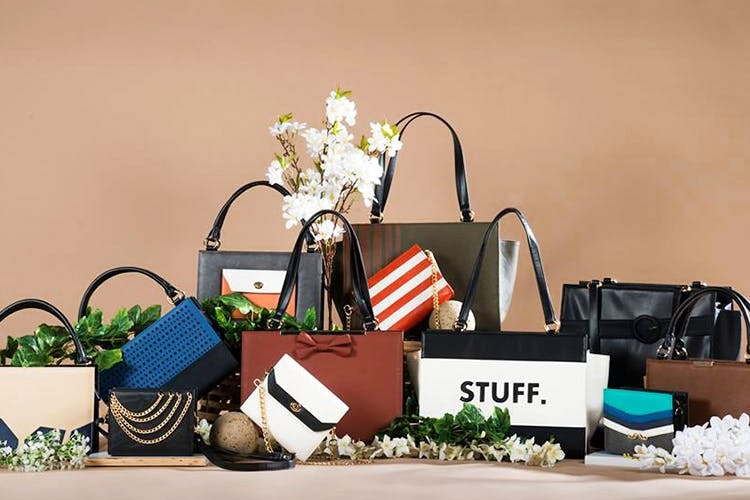 Nobby does handbags with interchangeable skins, so you don’t have to buy a truckload of them. Just style them with a skin that looks best for the occasion, and you’re good to go. The struggle might be real when it comes to choosing the right bag to go with your outfit for the night, and Nobby wants to take care of that with their smart fashion solution. What is it, you ask? They’ve got bags with interchangeable skins, so you only actually need to own one base bag, and then customise it with the style and design of your choice. How it works is pretty simple—you buy a base bag which comes with a skin attached (they’ve got small, medium and large sizes), and then you only need to buy different skins to customise the bag and change its whole look. The skins are attached to the base bag with super-strong magnets, so just pop it out, attach the other skin and bam—new look activated! There are skins with metal moustaches, classic blacks with gold chains, quirky stripes, bold solids, geometric patterns, slogan patchwork, and more. You can even change the strap or handle of the bag and add charms to it—doesn’t matter if it’s a night out with the gang, or a work meeting you have to go to, Nobby’s bags will fit in perfectly with your wardrobe (and won't take up much space either). We wish they'd keep adding more unique skin designs on a somewhat more regular basis.